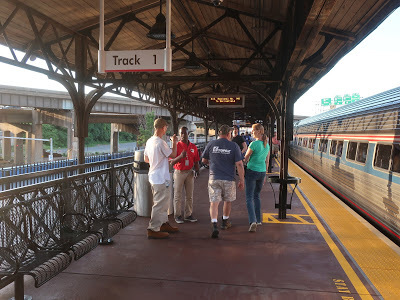 So the CTrail Hartford Line opened up on Saturday! I…uh…I don’t think I’ve ever seen so many strange characters in a single day. Read on, and you’ll find out every weird thing that happened to me, as well as reviews of every station on the line. The whole mess began, as many messes do, with Greyhound. 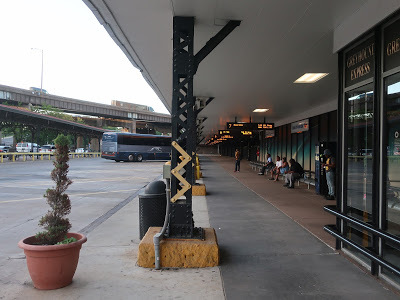 My friend Jeff and I were getting the 6:45 Greyhound bus to Springfield, where we would board the first ever southbound Hartford Line trip and ride to New Haven. The bus ticket said the bus was boarding at 6:25, and I planned to get there even a little earlier because I had been suffering from a stomach bug for the past few days, so I needed to accomodate my body if it had any ideas. “I’ll get the 5:30 83!” I had told myself the night before. But right when I was about to leave, I remembered “Oh wait, it’s Saturday, the 5:30 83 doesn’t exist.” Okay, Red Line it is. I got to South Station at 6:10, and luckily, the bug was cooperating, so I had to get to the bus terminal as slowwwwwly as possible. How should I do that? I eventually did make it to the bus terminal, but I was still too early, so I just stared at the regional bus map for a while. Jeff must’ve gotten past me without me noticing, because I got a text saying “Meet me at Gate 7.” I walked to Gate 7, where I saw Jeff standing in line for a bus going to…”Worcester.” “Is this the right gate?” I asked. “Watch my stuff; I’m going to ask at the counter,” Jeff said. Yup, that makes a lot of sense. So yes, it turned out this bus was going to Syracuse via Springfield. Now we could focus on the other problem: it was 6:40, and the bus hadn’t shown up yet. There were buses in the two gates next to ours, but nothing at Mr. “Board at 6:25 for the Bus to ‘Worcester'” Gate 7! The bus had now gotten so late that it had disappeared and the gate sign had changed to the 9:45 trip to Screw You, KS. Or something. Finally, at 6:55, the bus pulled in. 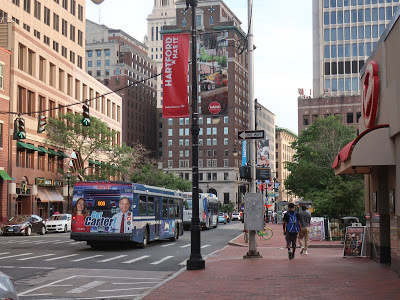 “Bus to Worcester, Springfield, Albany, Syracuse!” the driver shouted. “Please have your tickets ready!” Jeff bolted out of line to show his priority boarding ticket. “Uh, okay,” the driver said. “Anyone with priority boarding, please step forward!” No one else had gotten it. 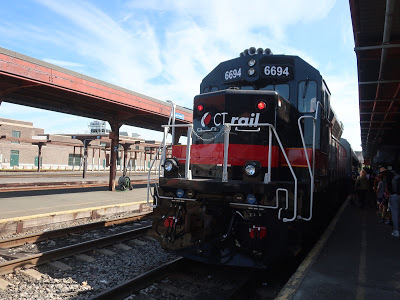 The ride itself was uneventful until we got to Springfield and pulled into the berth. A Greyhound employee stormed up to the door of the bus. “You can’t be in this berth!” she yelled up. “You have to be in Berth 26! You could be fined for this!” “Okay,” the driver responded. “But they told me Berth 21.” He turned to the passengers. “Everyone please sit down,” he called out. “EXCUSE ME YOU HAVE TO MOVE RIGHT THIS INSTANT, YOU COULD BE FINED 1500 DOLLARS!” the lady outside screamed. “Lovely woman,” muttered the driver as he reversed to go loop around. “What’s going on? I need to get off!” asked a passenger as she came scrambling up to the front. “Don’t worry,” some other people said. “We’re just going to another berth.” But one old man, in the most condescending way possible, said, “If you had taken those headphones out of your ears, you would’ve known what was going on.” Ouch! 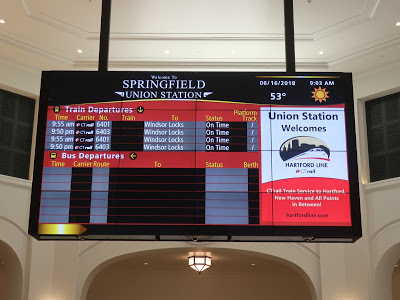 But we were finally here at Springfield Union Station. Points of interest included the departure boards finally kinda working and the really nice CTrail ticket machines. Sure, each one seemed to have a defect of some kind, but they were overall great. They even programmed in that tickets were $0.00 for the weekend, so we got some for our trip. 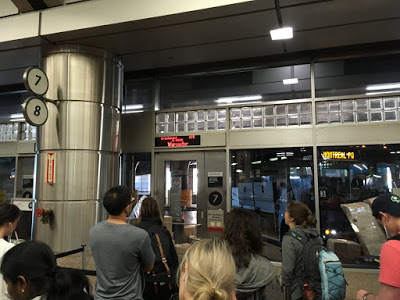 Okay…no bus or Amtrak departures…and the destination is wrong…yeah, the sign isn’t perfect. These smaller signs are just for CTrail, I guess. They’re supposed to talk, but they don’t. We went up to the platform, where it was foamer central. If you don’t know what a foamer is, think of them as the reason I call myself a transit enthusiast and not a railfan. They’re the kind of people who go up to the edge of the yellow line and squat down just to get a picture of a signal box or something. I’m sorry if this offends anyone, but I really hate that kind of behavior. One man stood out among the crowd. He had an American flag top hat, an American flag shirt, and American flag shorts. And, of course, he came up to us. He said he was from Boston and he was “fanning” the line. “Hey, I think I saw you on NBC!” he said to me. “Oh yeah, thanks!” I responded. “Yeah, you got the T running for its money,” he said. “You had some great idea or something, right?” “Uhhh…I’m not sure?” I said. “Yeah,” he replied. “It was a great idea. I get a lot of ideas, but the T won’t listen to me.” Okay, I’m sure you do. At one point, a Springfield police car was driving up on the elevated station. “Is that an actual road or just the right-of-way?” Jeff asked. “It’s the right-of-way,” our American friend replied. “But the weird thing is that this isn’t even their jurisdiction.” “Yes, it is,” Jeff said, “It’s their town!” “Uh uh uh…yeah, I guess.” American friend stuttered. I’d recognize those horrible ex-MBTA West German cars anywhere! Aw, it’s going way down there? As would become the theme for the day, the train coming up arrived late. Jeff and I made our way to the back to meet his friends from New York, Kurt and Sunny, who had come up from New Haven. On the way, we passed an old man wearing a full-body pink spandex jumpsuit. Just thought I’d mention that. The ride to New Haven was pretty nice! It was scenic, we were talking, and the car had no AC. Yeah, that was a blast. It didn’t help that the train was getting packed, because of course it was, because the fares were free. The dwell times at each station were ridiculous, since the conductors had to manually open and close each door themselves, not to mention the huge crowds getting on at each one. The car when we were just getting on. Looks basically the same as the T ones, except with a map on the end. “Well, you have the three best people to help you do it,” Jeff said. Our train was scheduled to get into New Haven Union Station at 11:29. There was a 215 bus leaving for Wallingford at 12:56 (it was running late). That meant that if I reviewed New Haven Union and New Haven State in a little over an hour, I could make that bus. Well…except our train was 25 minutes late. That made things more exciting. 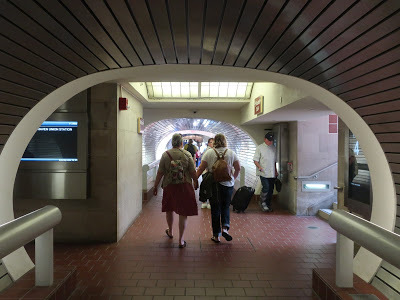 We got to New Haven Union Station and Jeff and Kurt headed off to the bathroom, while Sunny and I took on the task of reviewing the station. I started going down the stairs, but Sunny called out “You know, if you’re gonna review the platforms, you might as well do it now!” Good point. There are four platforms, and they’re all basically the same: vending machines, staircases and elevators downstairs, and then a whole lot of nothing. 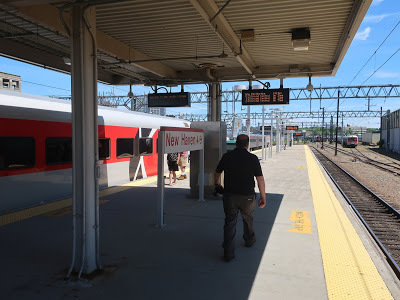 Also, I was reviewing a Metro-North station! How cool is that? The tunnels connecting the platforms. The entrance to each platform has nice, modern screens saying when the next train on that platform is departing and what stops it’s making. Each one is connected by two long, weird tunnels, and I don’t know why, but I really like them. They’re quite unique architecturally! It would make more sense if each one was only for one direction, but they don’t seem to do it that way, so it ends up being a little chaotic. The tunnel ends with a few shoe-shining chairs, and the path curves to the left. 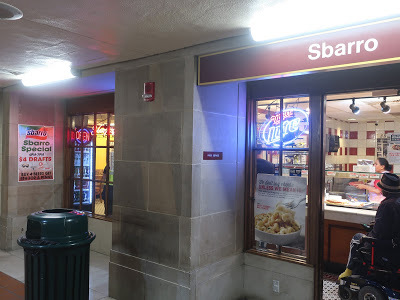 You enter an atrium that has a Dunkin’ Donuts on one side and a really sketchy-looking Sbarro on the other. It’s also just weird to see a Sbarro in any place other than a mall food court or an airport. From the atrium, there are escalators, stairs, and an elevator leading up to the main station. There’s also an office for the…ahem…MTA police. 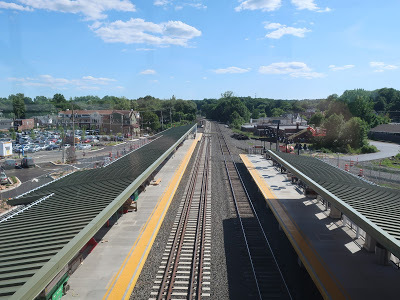 I’m reviewing a Metro-North station!!!!!! Oh yeah, this station is legit. The main hall of New Haven Union is awesome. Benches go all down the middle of it, and each one has a different model train on the top, which is the cutest and most amazing thing I’ve ever seen in a train station! There’s a big electronic departure board on one wall of the room, and it manages to not look too ugly, which I say is an achievement (being an electronic departure board and all). 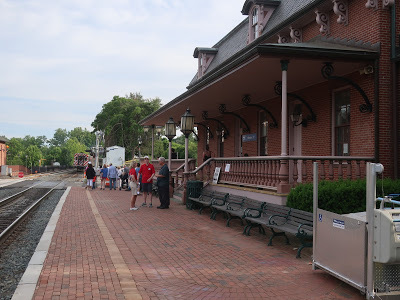 A few different aspects of the station on view. One long wall of the building is lined with ticket offices and machines, while the other side has some retail: Dunkin’ Donuts, a convenience store, and a Subway. And as much as I like Subway, its presence in here is a little annoying because it makes the whole room smell like…Subway. 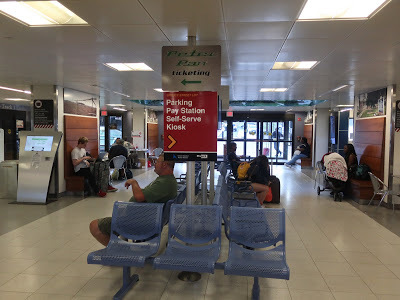 Going out to where the intercity bus terminal is, there’s a small atrium with an Avis office, some brochures, and a payphone. Welp…this is about it for the intercity bus terminal. No waiting area. No departure board. The intercity bus terminal is literally a wastebasket and a bunch of lines painted on the ground. Well, geez, that’s lame. There’s also a Greyhound Package Express here…maybe you could wait in there? At least it’s an inside room with shelter! 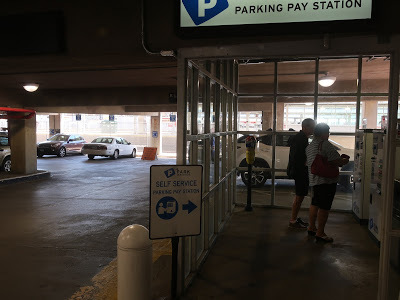 There’s a parking lot next to the bus terminal with Avis cars in it, so that’s what the office from before is for – you can rent cars from here! 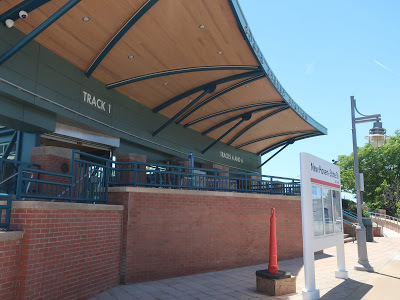 Coming around to the main entrance of the station on Union Ave, there’s valet parking, taxi parking, and a bus stop in front of the station’s facade. 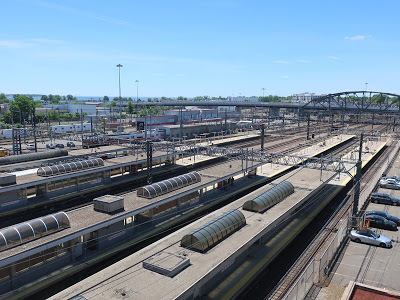 Of course, there isn’t much around the station itself, because…well, Union Station is kind of in the middle of nowhere, at least relative to downtown. That’s too bad, but I guess they needed a bunch of space to put in this big station. We came back to the main hall and took another hallway. 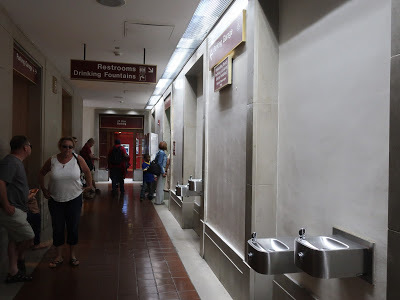 This one had a bunch of vending machines, and further down, there were drinking fountains and bathrooms. They were really busy and I didn’t have time to get a good look inside, but it looked like a perfectly fine bathroom, from what I saw. There’s also an ATM in a separate room. This station goes heavy on the atriums! Coming around to the north end of the building, one can look down and see the escalators down to the tunnel to the platforms. There are a few lame brochures here and that’s about it, but the door leads to a path to the station’s parking garage. The whole thing is sheltered, which is much appreciated. I can’t get any information on how many spaces this garage has, but I’d assume a lot, since, you know, it’s a garage. It costs $2.00 per hour or $18.00 per day, which is insane. A monthly pass is $95.00!!!! Interestingly, though, the whole thing was pretty full. Sunny and I did the obligatory trip to the station’s roof to get the view, and there were a ton of cars up there. Also, from the elevator to the lot on the roof, there was just a curb with no cut. Sorry, wheelchair users! There’s also extensive bicycle parking and a surface lot just north of the garage. 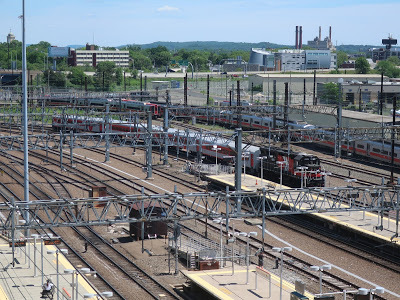 A Hartford Line train…from above. 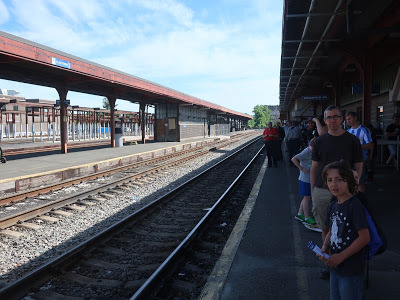 Also, bonus Metro-North! Jeff and Kurt had to get back to their respective destinations, but Sunny was able to stay for New Haven State. We said goodbye and hopped onto the 12:12 Shore Line East train there. It was my first time on Shore Line East, which was very exciting, and I was shocked at how busy it was! 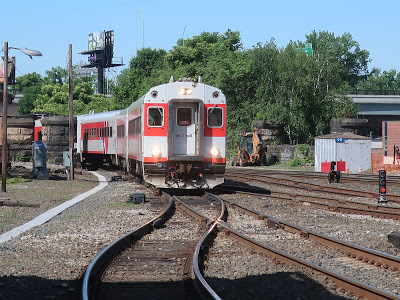 The train departing New Haven State. So New Haven State is a rather simple station, but I like it. 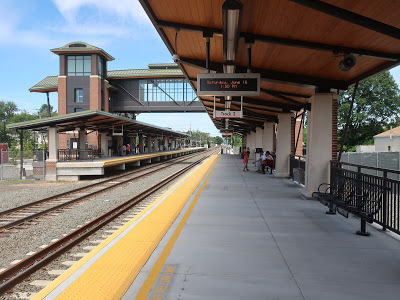 The platforms are very typical: they’re sheltered for the most part (it’s a small station), and they’ve got benches, wastebaskets, and recycling bins on them. There are some detailed departure boards on TV screens, and though they’re very dim, they’re super nice to see. It also has train status boards all along it, also very nice. A ticket machine and some bus schedules. There are stairs and a very rickety old elevator leading up to the upper mezzanine. 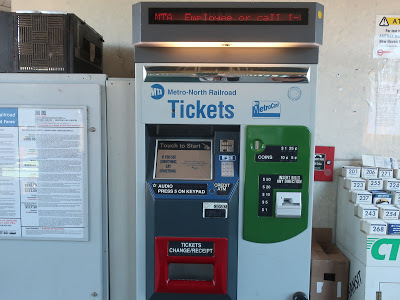 It has a Metro-North ticket machine, some CTtransit bus schedules, and a “press for heat lamps” button. Maybe it’s because it’s the summer, but…those heat lamps didn’t work. Well, shoot. From here, a footbridge leads to the station entrance. State Street’s entrance is super modern. 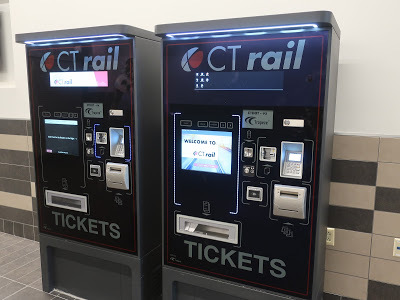 This is where the CTrail ticket machine is – it’s on the way to the Track 1 entrance. Track 1 is the Union Station-bound track, so it’s a little weird that the machine is there, but okay, sure. 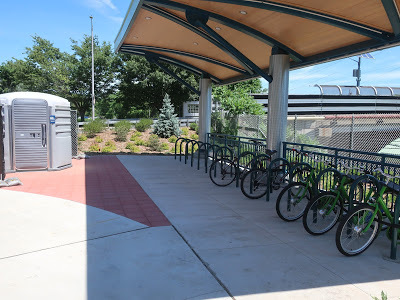 The station also has a portable restroom (because of the Hartford Line bathroom debacle) and some sheltered bike racks. The two things described in the previous sentence. Now Sunny and I headed over to the New Haven Green, the big bus terminal of the city. I went up to the ticket vendor to get myself a day pass, and the guy gave me a free CTtransit ticket holder along with it! Well worth the $3.50. Sunny had to head out from here, so we said goodbye as I hopped aboard the 215 bus to Wallingford. Oh, excuse me, 215M. 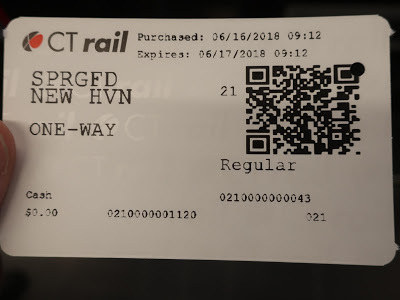 Thanks for adding letters to everything, CTtransit New Haven. I gotta say, this ride was pretty darn unbearable. It was long, it was slow, we had to make deviations, and the scenery just wasn’t all that interesting. I did kind of like it when we left this long section of suburban businesses and it became just nice houses lining the road, and that was where the bus started to get faster, too. 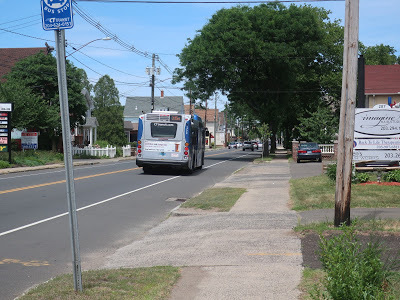 There was no crosswalk to the Wallingford Station parking lot, so I just had to jaywalk across busy North Colony Road. The lot had some awesome foliage in it, it had space for 221 cars, and the fee is just $2.00 a day. It’s actually free until September, too! 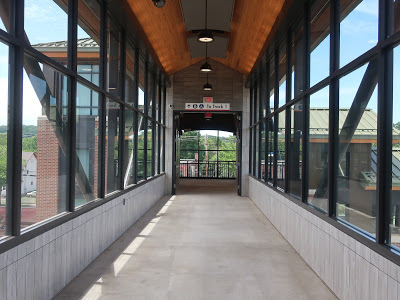 The station’s entrance has a lovely wooden shelter where people can wait for their rides. Under that shelter are also some bike racks (although not enough, in my opinion), parking pay stations, and a CTrail ticket machine. On the other end of the parking lot, there’s another shelter for waiting for pickups as well. So this is the standard design we’ll be seeing for the next few stations. It’s a sheltered high-level platform with benches and wastebaskets under the whole thing. There are train status boards all along the platforms, plus a shelter on each side that has a really noisy departure board in it. 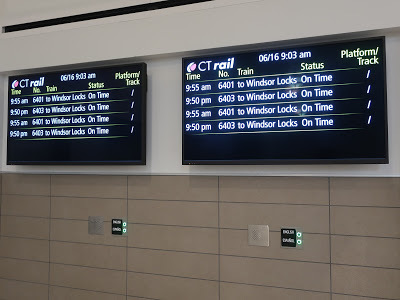 They honestly show far better information than the status boards, which use the same voice as the one on Commuter Rail trains and tell you the train is boarding ten minutes before its scheduled arrival. Up on the station’s footbridge. These stations all have footbridges between the platforms, and they’re all basically the same. The architecture is really nice – modern, but with a lot of character. People have the option of using stairs or glass elevators to get up to the top, and vice versa on the other side. There are also departure boards up here. Looking down the station…from above. Man, it was boring here. I didn’t have enough time to go check out the town, so I was just stuck here at the increasingly busy station. I looked down the platform. Most of the people were just families checking out the line, except…oh no…it was American flag man! I ducked back so he wouldn’t see me. The CTrail train finally arrived, running late of course. “It’s so beautiful,” my railfan friend said. “Not really,” I responded. “It’s a really bad West German car from over 30 years ago.” “Trains are so beautiful…” he responded. We stepped on, and he wanted to go to the front, where a bunch of teenagers were crowding the front window, all fighting to get a view with their cameras. One of them was Facebook Live-ing the whole thing. Because I’m sure a ton of people want to watch that live. I had no desire to interact with these people. “Look, a signal!” one of them exclaimed, pointing at, yes, a normal railroad signal. However, the man from Hartford wanted to, so I just stood back and let them have their conversation. The 9 minutes to Meriden was a long 9 minutes. Meriden was very similar to Wallingford. It had the same architecture, the same amenities on each platform, the same footbridge, everything. This one was cool, though, because it was pushed right up against a downtown block of buildings. There was an exit to that street, Colony Street, as well as south to Main Street. I again had time until the train was supposed to come, so I decided to see where the loud gospel music was coming from. It turned out there was a religious festival going on in the nearby Meriden Green. I didn’t want to go in there, partially because…yes, there was American flag man wandering around the festival. I’m glad he was enjoying it. There was a food truck there because of the festival, so I did go to that to buy a bottle of water for a dollar (not bad!). After that, I hung out on this nice bridge overlooking a river. It was a very pleasant experience, especially since I had the lovely music coming from the nearby festival. I got back to the station in time for the train’s scheduled arrival, but, of course, it was late. 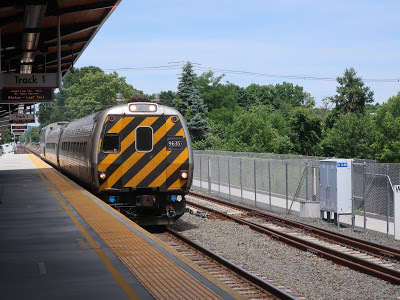 And what did end up coming was…a Shore Line East train? 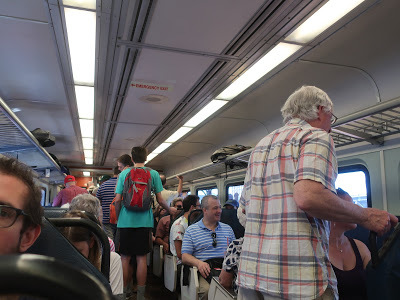 “We’re standing room only,” the conductor yelled out as the train came in. I was only going one stop, so I didn’t really care. It was annoying to see that there was another car, completely empty, that wasn’t open, but it must’ve had something to do with the number of conductors on board. This ride was rather unbearable too, mostly because I was standing in the aisle and people kept trying to get past me. Also, there was this one woman who was blasting old R&B music and singing along to it…badly. Yeah, that didn’t exactly help make the ride more enjoyable. 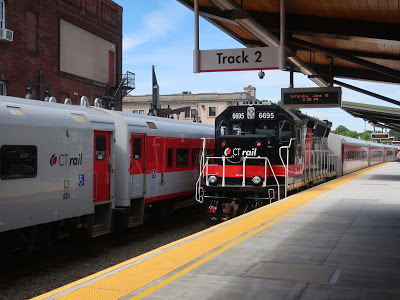 Now I had to make the decision about whether it would be better to A) Wait for a train, B) Wait for a 512, take it to New Britain, and do a 101 to Hartford, or C) Just walk to New Britain. The bus was coming in 15 minutes, the train in about half an hour, but they would both get me to Hartford in about the same amount of time. Walking seemed like a bad idea at this point. Suddenly…a train horn? Yes, that was definitely a train horn. I got up and looked down the tracks. 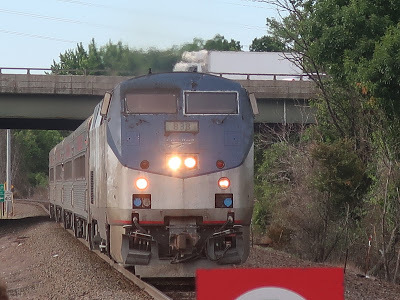 It was a random Amtrak train! And it was in service! 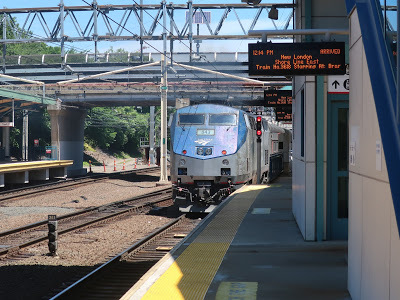 “Train to Hartford and Springfield,” the conductor said as he stepped out. Okay, well, this was a stroke of luck! I was so shocked that this was the only picture I could get! It was nice to finally have a seat on a train. This was also my first Amfleet all day, and there was an issue of The National in the seat pocket, so I started to read it. Someone kept pacing up and down the train. I had been seeing him a lot all day. Eventually he asked me “Is this seat taken?” “No, go ahead,” I responded, and he sat down. “So you’ve been railfanning the line a lot, huh?” he said. “Yeah, I guess I have,” I responded. “Hey, you look familiar,” he said. “Do you happen to write a blog?” “Yeah, I do!” I said. “Miles on the MBTA?” he asked. “Yeah!” I exclaimed. He said he used to read the blog a lot, which was awesome to hear! This was bad for my companion, because he had a hard deadline at 7 – that was when his coach bus was leaving Hartford. The situation gave me an idea, though. 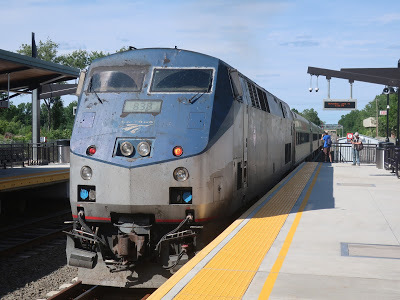 Instead of getting off at Hartford and taking a bus to Windsor, taking a train to Windsor Locks, and walking to the 30 bus from there (almost an hour, no sidewalks), I could take this train to Windsor Locks, get the train from Windsor Locks to Windsor, and get a bus back to Hartford! I told my companion about the plan and started going through the schedules to make sure it would all work. He said he’d go up to Windsor Locks with me – since he couldn’t go to Springfield, he might as well go as far up the line as possible. 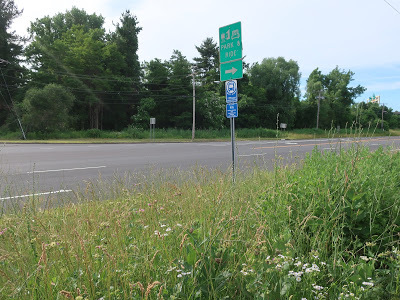 First we had to move, though – it was embarrassing sitting here and watching the CTfastrak buses speed by on the parallel road! 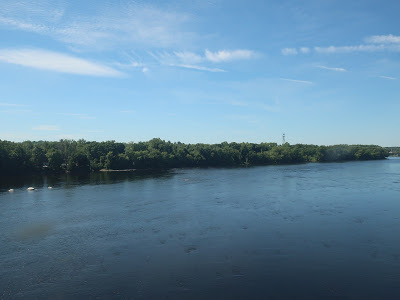 Finally, we started moving, and, in the longest ride of the day since the initial full run, we rode up to Windsor Locks. I am standing at one end of the platform. That is the other end. As we were waiting here, a smarmy guy in a fake conductor’s uniform and his friend came on to wait with us. “I know every conductor and engineer on the line,” he said to us smugly. “Actually, probably more than everyone.” Ughhhhhhhhhh. “Train 488 is definitely gonna get here before 467,” he said (488 being the northbound and 467 being the southbound). But no, luckily, the southbound train came first. And it was the Shore Line East one! We had the choice of a packed car with AC, or a practically empty car with no AC. “We have to take the car with AC,” Mr. Conductor said, and he led us into that car. There didn’t appear to be any seats available, but we kept going forward. “BACK!” he suddenly shouted, so I, at the end of the line, turned around and started going towards the non-AC car. He and his friend were coming with us, but suddenly, they turned around and just grabbed two seats in the AC car. Okay, if you didn’t want our company, you could’ve been nicer about it! My companion thought it was just because they wanted the AC, which was probably true. I mean…I hope it was true. At Windsor, I left my friend and we waved goodbye through the window. I never got your name, but if you’re reading this…hi! Thanks for coming up to Windsor Locks with me! Anyway, Windsor was also a low-level platform, but it had a ton of benches along it, as well as a lovely building. There were places to sit under its awning, but the inside of it has been converted to what looked like an art studio. There also might one day be a second platform here, because they were doing double-track construction. Remember how I mentioned that stomach bug? Yeah, well, it was starting to act up around this point. I originally thought to go to the library, but wait, it was closed. Luckily, there was a Subway across the street, and they tend to have bathrooms, so I went in there. The cheapest thing on the menu appeared to be those awful processed fast food apple slices, so I decided to get one of those. “Could I have some apples, please? And a bathroom key?” I asked. “Oh, the bathroom is just open,” the cashier responded. “Oh…” I responded. “Uh…do I have to get the apples then? I’m just here to go to the bathroom. I mean, I can still get them if you want. Uh…what do you want? I don’t mind.” The guy stared at me. “I’ll ring you up,” he said. My ride back to Hartford! I did my business, threw out the disgusting apples (sorry), and walked to the bus stop to get a 32/40 back to Hartford. Why is it called that? I assume it combines the 32 and the 40 in some way. It’s CTtransit, so nothing ever makes sense. 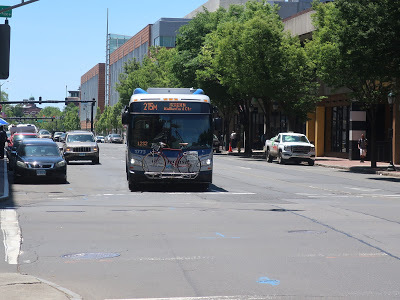 Anyway, this bus ended up going through some rougher parts of Hartford, and it was an interesting ride. All the passengers seemed to know each other. When I was getting closer to downtown, Sunny texted me. “You’re not on the 7:55 bus, are you?” it said. “It’s running REALLY late.” I checked the Greyhound tracker, and sure enough, it said it was supposed to be getting to Hartford at 9:30. Now, granted, the tracker was pretty inaccurate, and based on the bus location and the traffic conditions, it would arrive more at around 8:20. Still, it did mean I had some extra time on my hands. 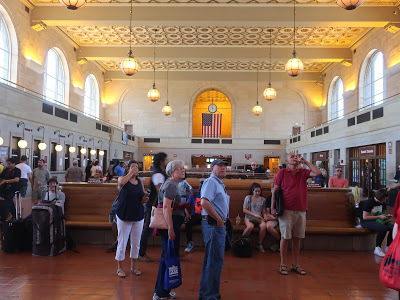 The first order of business, of course, was to review Hartford Union Station. 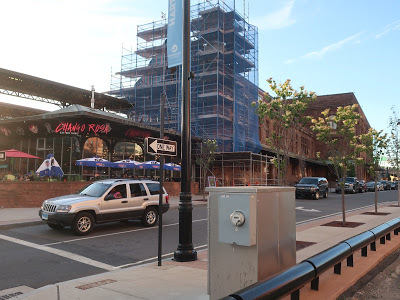 I like how the most prominent thing about Hartford Union Station from Asylum Ave, the main drag next to it, is an unrelated restaurant. In order to get to the station itself, you have to walk up Union Place. Okay, I will say that there’s a staircase from Asylum Ave up to the platform that you can use, too, but I wanted to see the main station. I got terrible pictures of the atrium, apparently. Here’s one of them. Hartford has one of the lamest station atriums I’ve ever been in. The whole thing is completely bare aside from a row of benches against one of the walls. There’s no grand departure board, just a lame TV screen showing the departures and arrivals. The place is functional, but it’s just really boring. All the action happens down a set of stairs (or a long-winded walk to an elevator)…in a low-ceilinged, boring room. 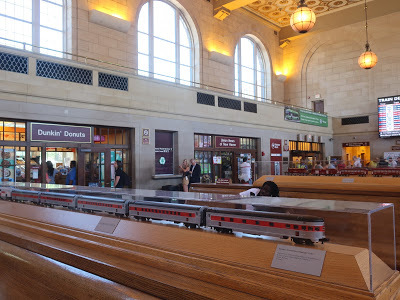 Here, there are benches, ticket offices for Amtrak and Peter Pan, ticket machines for CTrail, a Subway, and a Dunkin’ Donuts. Unlike the huge empty atrium, which feels way too spacious, this crowded, tiny room feels way too cramped. Up on the high platform. Stairs and a big elevator lead up to the platform, but the low-level section of it has been closed to passengers. Now, they’re directed to go to the high-level portion, which you have to walk a ways down to get to. It’s your standard platform: it’s fully sheltered, and there are benches and wastebaskets along it, as well as train status signs. Basically, what we’ve come to expect, except less modern this time around. 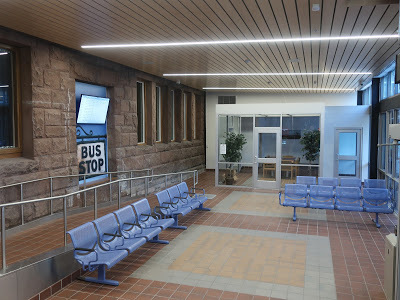 Also accessible from the main area is the coach bus terminal. It’s very bland, but it’s functional enough. It’s all sheltered, and there are some benches out here in case you want to wait for the bus outside. 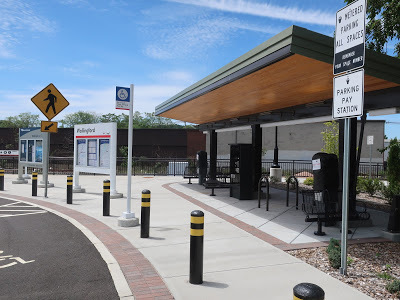 There’s also a center island between the coach bus parking and Spruce Street, and this is where people can wait for pickups and where many CTtransit buses stop. The Hallway of Vending Machines. 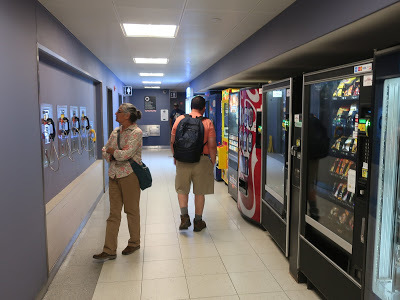 Again from the main area, there’s a hallway with your standard fare: an ATM, a parking pay station for the nearby Spruce Street lot (200 spaces), some payphones that work (! ), and some vending machines. Also…two claw machines and some spinner game. 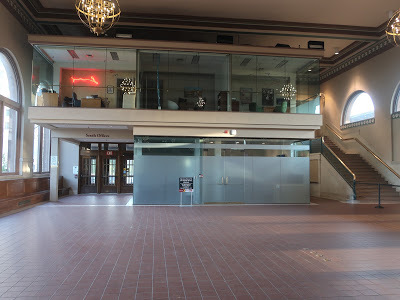 Yes, there’s a mini arcade within Hartford Union Station. A stupid arcade, but technically an arcade. Also, this hallway is where the bathrooms are, and they seemed fine (again, they were too busy to justify going into). So, I was finished reviewing the terminal and I still had half an hour until the late bus was going to arrive. 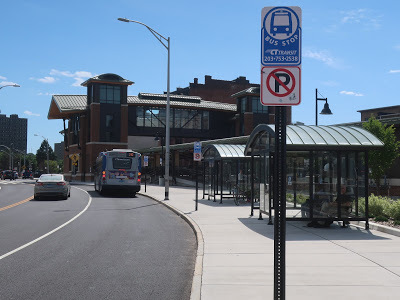 Well, there was a CTfastrak coming in one minute, and I couldn’t visit Hartford without riding it, so I ran to the stop and hopped on! 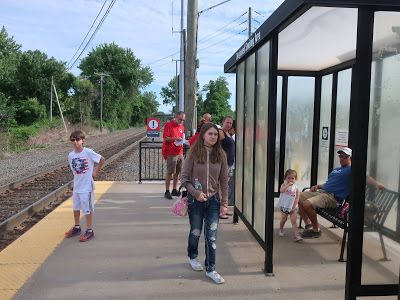 I’ve actually done a full CTfastrak ride before (it never made it onto the blog), but it was still awesome to be doing it again. I figured out that in order to get back to the station by 8:20, I would have to get off at Newington Junction. That wasn’t bad – it was more than halfway down the line. We arrived there, and I got off and crossed the tracks. The only other person there was a girl who looked like she was about sixteen. We sat far apart from each other in silence. “How old are you?” she suddenly asked. Okay, that was weird. “Eighteen,” I said. “You’re not going to Hartford by any chance, are you?” she asked. “I am,” I responded. “Why?” she said in a weird tone of voice. Who was she, the troll under the bridge? 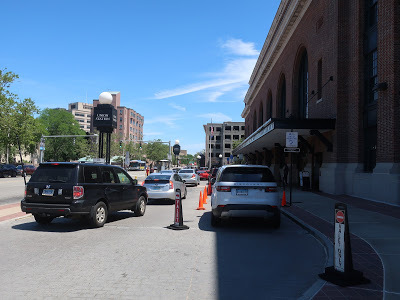 I explained how I had been riding CTrail all day for my blog and how I was from Boston. “Wow, so it’s already bringing people in from the cities,” she said. “Yeah, I guess,” I replied. The bus came and we got on. She shook my hand firmly and introduced herself, but I can’t for the life of me remember her name. It started with an A. She told me about how the CTfastrak had completely revitalized Hartford and opened up a ton of new opportunities. “Put that on your blog,” she said. Eventually, the talk turned political. “Isn’t it scary how some stupid person could just push a button and we could all die?” We were nearing her stop. “And you know, people just a little under your age, because I’m older than you and I hope you know that, are screwed, because they grew up only knowing a world of technology. I mean, if I asked you if you could use a library catalogue, you’d say no, right? Right? Exactly. So you’d better learn how to do things the hard way.” She shook my hand again. “Write an amazing blog!” And with that, she stepped off the bus, and I sat there, worn out from the intense conversation. I hit the stop request button when we pulled up to the Union Station stop. Stepping out, I saw a Greyhound bus signaling left to go into the station. What did its destination board say? I squinted. “BOSTON MA.” Oh no! 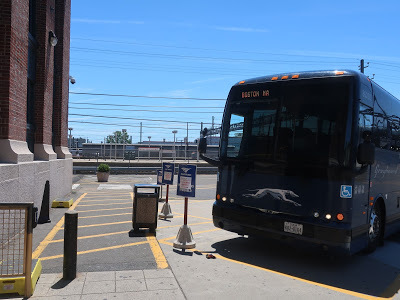 I started running, jaywalking across the empty Asylum Street and coming into the coach bus terminal just as the bus pulled up to make its stop. I had made it. “Good evening, ladies and gentlemen,” said the driver over the loudspeaker in a soothing, deep voice. “This bus will be headed for Boston, making no stops in between. The trip should take about an hour and a half, traffic permitting. My name is Mr. Jones, and I’m here to make sure your trip is a pleasant one. Sit back, relax, and enjoy the ride.” I reclined my seat back, got into a comfortable position, and fell asleep. So, that’s my crazy CTrail day. I don’t think I’ve ever met so many strange and interesting people over a 24-hour period! It was exhausting, it was fun, and it made for a great story. Hopefully you all enjoyed reading it. 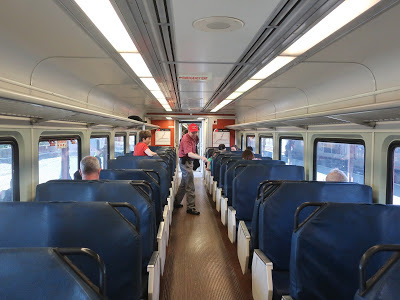 As for the Hartford Line itself, I was overall quite happy with the service. 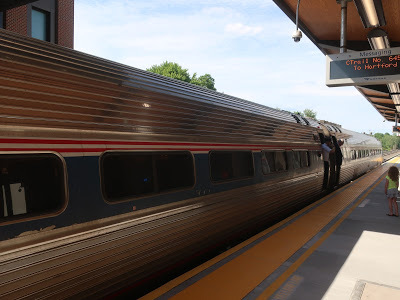 It’s adding frequency to an important rail corridor, and the integrated fare system with Amtrak means that more trips can be made up and down the line. Yes, it had severe capacity problems and delays this past weekend, but that’s because rides were free and the service isn’t designed to transport 10,400 people in a day (that’s how many people rode on Saturday!). 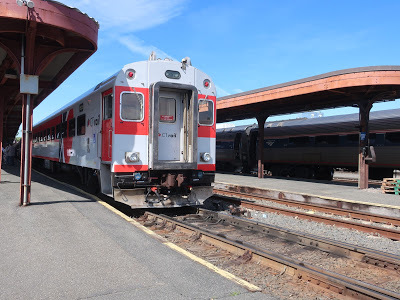 It still seems like a lot of their trains are running late, so schedule times might have to be adjusted to accommodate dwell, but overall, I’m excited to see what kinds of opportunities this line brings to western MA and Connecticut. Next up, give us a proper rail line from Springfield to Boston! Miles, just curious. Are you going to do bonus reviews of the bus routes you took? 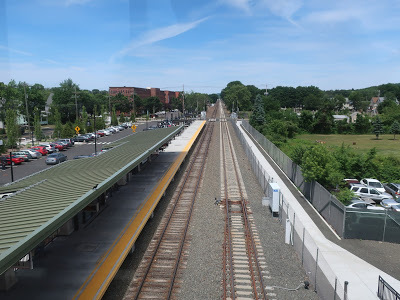 What about the CTFastrak stations between Hartford and Newington Junction? Thanks for the bundle of reviews. New Haven State Street looks like a really useful station. 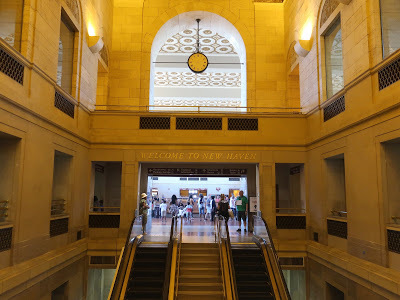 New Haven Union Station is a bit weird–they did major refurbishment a while back, showing off all the old, pretty architecture, but it looks like the food/retail tenants they could get were things like that Subway. Still, it's food, and I've been glad of it occasionally when waiting for/changing trains there. It was a pleasure meeting you Miles! 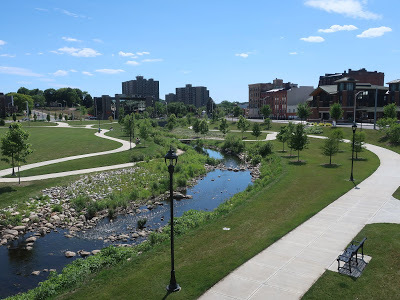 Springfield,MA shall remain on my bucket list. Great to meet you too, as well! I wish you good luck in eventually getting to Springfield. First and foremost, I think I might've seen you at Springfield for a hot second. Did you get a haircut or something, because comparing your Facebook profile pic and you in person showed some visual differences. After reading your review, I must say, your journey was quite impressive and very much true. 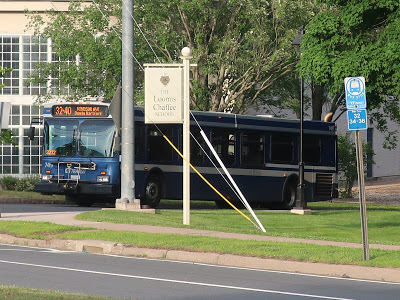 The 215M is one of the longer routes in New Haven. I've ridden on it a couple dozen times or so, and it sometimes feels like it's never going to end! 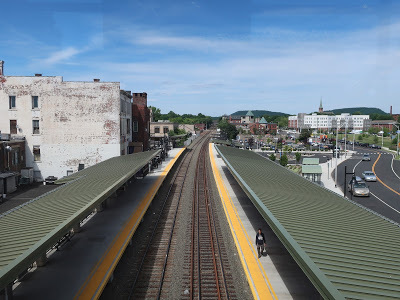 Something I want to note, is that there is nothing (and I mean nothing) of true interest in Wallingford, aside from the old, 19th century train station, and the crappy concert venue. Funny that you call the State St elevator rickety, as the day after, it shut down access to tracks 4 & 6 for "maintenance issues". 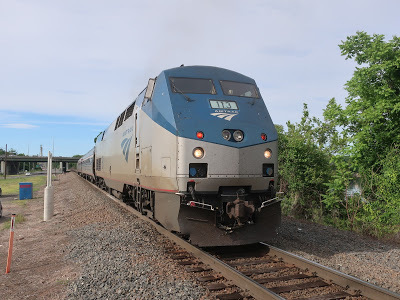 Lastly, I agree with the description of Springfield after 6400 arrived…I don't think I've seen so many people pointing cameras at trains….ever! It was absolutely astounding, especially the difference in age (The youngest was probably around 13 or 14, and the oldest was probably in their 50s or 60s, at least from what I observed.